You may or may not know this about me: I have a thing for dessert parfaits. Though I thoroughly adore the idea of having homemade, from-scratch baked goodies like cookies, cakes, croustades and rustic pies at my fingertips, we don’t usually have those sweet treats but on special occasions, or when I’m specifically in the mood to bake. Here’s my confession: I lack a baker’s patience. It just seems to take too long when that sweet tooth hits to prep all the ingredients, then bake, and then wait for the thing to cool! That being said, I’m certainly not going to give up rich, creamy and dreamy desserts; and that means I’ve developed my own strategy for making delicious desserts as quickly as possible, and without the use of my oven. When it comes to parfaits, the fun for me is in trying to replicate the flavor and texture profiles found in my favorite (though more complex) desserts, but in a quicker and easier way. On Thanksgiving day, the oven is already being used for so many side dishes as it is, never mind for the actual turkey; so if there’s a way to skip it when it comes to the mandatory pumpkin dessert, then I’m all for it. 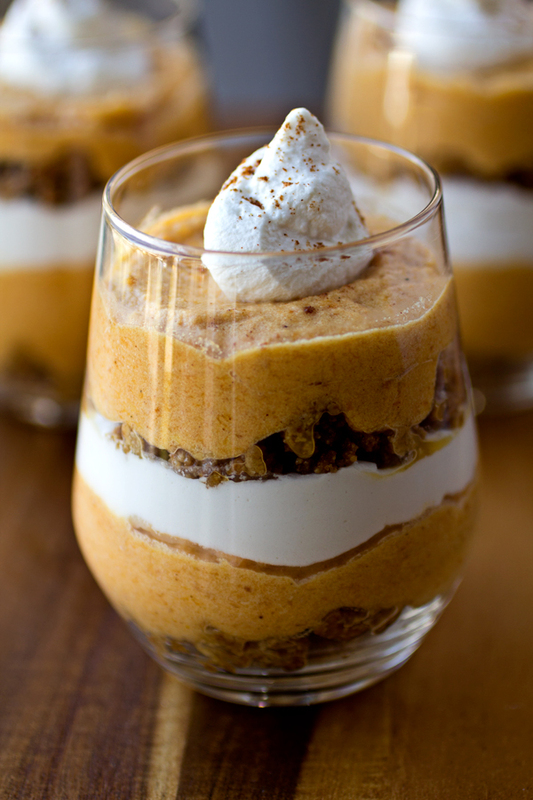 Pumpkin pie is so wonderfully rich, creamy and decadent, and full of warm spices; the rich crust, not to mention the light, mousse-like texture of the filling, makes it a scrumptious sweet contribution to the Thanksgiving table that anyone would be willing to unbutton one or two extra pant buttons over, so it’s truly the perfect candidate to be turned into a parfait. 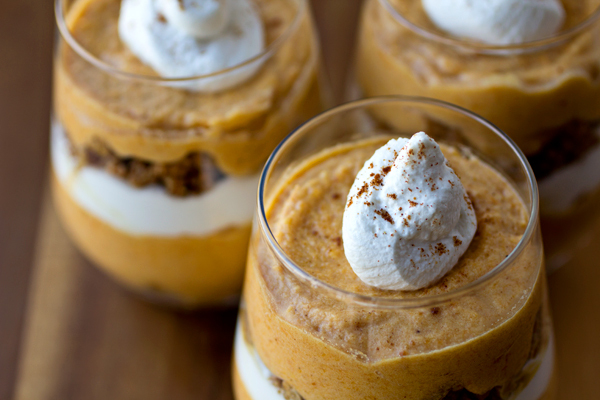 Thanksgiving is the holiday for a sweet, creamy pumpkin dessert; for the zip of cinnamon and spice on the tongue; for the cool, velvety-ness of a mousse-like filling; and for the rich, buttery-ness of a honey-sweetened, crumbly crust. 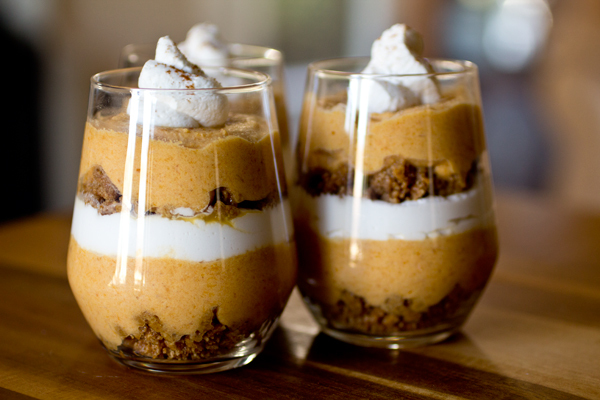 Pumpkin Pie Parfaits capture the wonderful flavors of the fall and Thanksgiving in a glass—they contain all the coziness and pleasure that one would expect from a baked dessert. 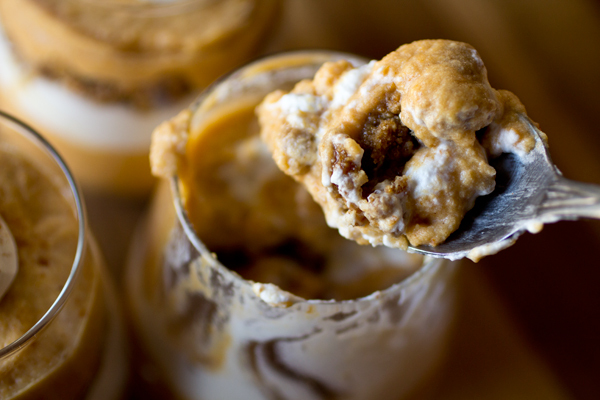 Uniquely beautiful, with a flavor and richness that is traditionally expected, these tasty parfaits are a new and different way to do Thanksgiving Day dessert—just let your fridge do the work instead of your oven. -Begin by preparing your Chantilly Whipped Cream (recipe below), and place into the fridge to keep cold. -Next, prepare your Spiced Pumpkin Cream (recipe below), and place into the fridge to keep cold. -Place the finely processed graham crackers into a medium-sized bowl, and add in the honey, apple sauce, cinnamon and pinch of salt; using your fingers, combine the ingredients together until they become moist and form a graham cracker “crumble”; cover with plastic to keep from drying out, and set aside until ready to assemble the parfaits. 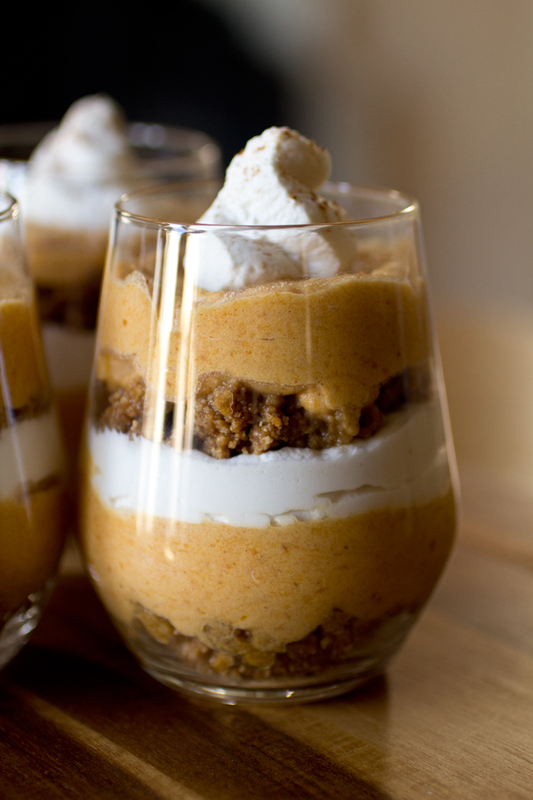 -To assemble the parfaits, place your glasses in front of you, in a row; add about 4 tablespoons worth of the graham cracker “crumble” into the bottom of each glass; next, pipe in about 4 tablespoons worth of the Spiced Pumpkin Cream over the crumble, and then, pipe in about 3-4 tablespoons worth of the Chantilly Whipped Cream over that; repeat the layering process once again by adding a layer of the graham “crumble”, then the Spiced Pumpkin Cream, and finally, a generously piped dollop of the Chantilly Whipped Cream in the center of the top of the parfait; finish by sprinkling a touch of cinnamon over top, and chill in the fridge for at least an hour before serving. -Add the cold whipping cream to the bowl of a standing mixer fitted with a whisk attachment, and begin whipping the cream on medium-high speed; once the cream begins to thicken slightly, sprinkle in the sugar, and then add in the vanilla extract, and finish whipping until stiff peaks form. -Next, take about 1 heaping cup’s worth of the whipped cream, place it into a small bowl and cover with plastic, and set aside in the fridge for a moment to keep cold (you will fold this reserved cream into the Spiced Pumpkin Cream in a moment). -Take the remainder of the whipped cream, and spoon it into a piping bag or a large ziplock bag (cut the corner off the ziplock bag when you’re ready to pipe the cream into the glassed), and place into the fridge to keep cold until ready to use. -In a large bowl, add the room temperature mascarpone cheese, and with a spatula, gently stir it to smooth and fluff a little bit. -Next, add in the 1 cup of pumpkin pie filling, and gently fold/blend that into the mascarpone cheese. -Next, add in the super-fine and the brown sugars, the rum and the pumpkin pie spice, and blend those in well. -Finally, fold in the 1 cup of reserved Chantilly Cream, blending it in gently, but well. -Spoon the Spiced Pumpkin Cream into a piping bag or large ziplock bag (cut the corner off of the ziplock bag when you’re ready to pipe the cream into the glasses), and place into the fridge to keep cold until ready to use. 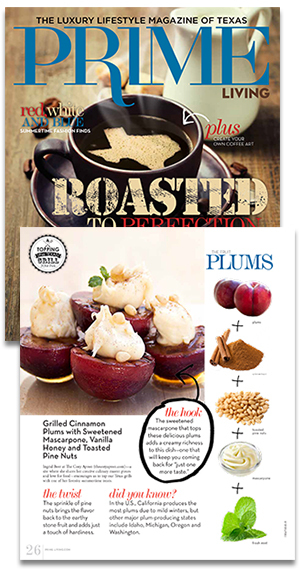 I’m also an insane lover and proponent of parfait desserts–they’re such quick and satisfying alternatives! I’m glad I stumbled across your blog, this looks absolutely delicious. Keep up the good work! LOVE this! I made something super similar a few weeks ago but used gingersnaps instead of graham crackers. I liked it but we just aren’t crazy about the gignersnaps. I’m totally make this for Sunday dinner and I know my kids will like your crumbles better. I’m a sucker for layered desserts like this too! Thanks and great blog. I’m so pleased to have found you! 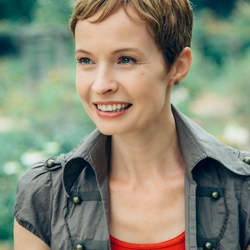 Hi Melissa, thank you – so glad you came by! What’s pumpkin filling? Regular pumpkin pulp? Hi Aleck, “pumpkin pie filling” can be bought in a can next to the pure, pumpkin puree— it’s just a presweetened and pre-spiced “filling” for folks that want to make pie, but don’t want to go through all the steps. Do you know what 20 sheets of ground graham crackers equates too? I already have some ground to crumbs that I want to use! Hi Deanna, I’m kinda guessing here, but I would say about 3 cups. Hope that helps! Hi just two quick questions if you get this: 1) Is the “super fine” sugar you mention the same as powdered sugar? 2) is there something I could substitute for the dark rum? Thank you. Can’t wait to make these. All of the pumpkin pie filling that comes in a can calls to be mixed with eggs and evaporated milk. Are we to do that or just use the filling itself as is? Hi Diana! Just use the filling, as is, straight out of the can; I provide you with the other ingredients, in my recipe, to add to it. (They only have you add those other things when you’re looking to make a pumpkin pie, specifically.) Hope that helps! How long will this dessert stay good in the fridge for?